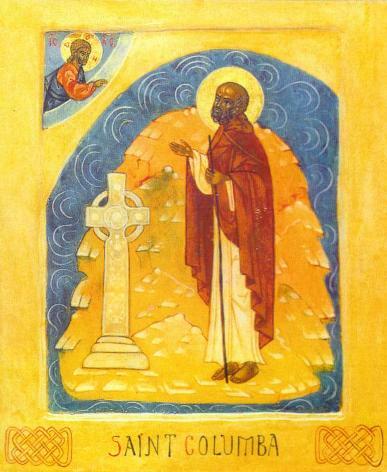 At another time while the holy man was tarrying in the Iouan island (Hy, now Iona), one of his monks called Brito, a person given to all good works, being seized with bodily illness, was reduced to the last extremity. When the venerable man went to visit him at the hour of his departure, he stood for a few moments at his bedside, and after giving him his blessing, retired quickly from the house, not wishing to see him die, and the very moment after the holy man left the house the monk closed this present life. Gen. 19:15-16 As morning dawned, the angels urged Lot, saying, “Up! Take your wife and your two daughters who are here, lest you be swept away in the punishment of the city.” But he lingered. So the men seized him and his wife and his two daughters by the hand, the LORD being merciful to him, and they brought him out and set him outside the city. 1 Kgs. 6:15-18 And when the servant of the man of God was risen early, and gone forth, behold, an host compassed the city both with horses and chariots. And his servant said unto him, Alas, my master! how shall we do? And he answered, Fear not: for they that [be] with us [are] more than they that [be] with them. And Elisha prayed, and said, LORD, I pray thee, open his eyes, that he may see. And the LORD opened the eyes of the young man; and he saw: and, behold, the mountain [was] full of horses and chariots of fire round about Elisha. And when they came down to him, Elisha prayed unto the LORD, and said, Smite this people, I pray thee, with blindness. And he smote them with blindness according to the word of Elisha. 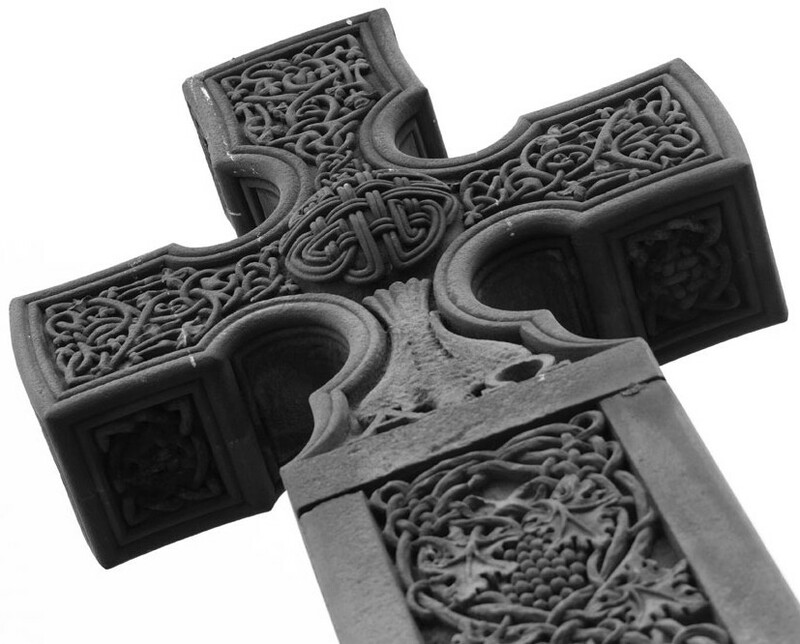 Tob 12:12-15 When thou didst pray with tears, and didst bury the dead, and didst leave thy dinner, and hide the dead by day in thy house, and bury them by night, I offered thy prayer to the Lord. And because thou wast acceptable to God, it was necessary that temptation should prove thee. And now the Lord hath sent me to heal thee, and to deliver Sara thy son’s wife from the devil. For I am the angel Raphael, one of the seven, who stand before the Lord. Job 33:22-24 His soul hath drawn near to corruption, and his life to the destroyers. If there shall be an angel speaking for him, one among thousands, to declare man’s uprightness, he shall have mercy on him, and shall say: Deliver him, that he may not go down to corruption: I have found wherein I may be merciful to him. Ps. 91:12-13 For he will command his angels concerning you to guard you in all your ways. On their hands they will bear you up, lest you strike your foot against a stone. Psa 103:20 Bless the LORD, O you his angels, you mighty ones who do his word, obeying the voice of his word! Psa 148:1-2 Praise the LORD! Praise the LORD from the heavens; praise him in the heights! Praise him, all his angels; praise him, all his hosts! Dan 8:15-18 When I, Daniel, had seen the vision, I sought to understand it. And behold, there stood before me one having the appearance of a man. And I heard a man’s voice between the banks of the Ulai, and it called, “Gabriel, make this man understand the vision.” So he came near where I stood. And when he came, I was frightened and fell on my face. But he said to me, “Understand, O son of man, that the vision is for the time of the end.” And when he had spoken to me, I fell into a deep sleep with my face to the ground. But he touched me and made me stand up. Dan. 10:19-21 And he (St. Gabriel) said, “O man greatly loved, fear not, peace be with you; be strong and of good courage.” And as he spoke to me, I was strengthened and said, “Let my lord speak, for you have strengthened me.” Then he said, “Do you know why I have come to you? But now I will return to fight against the prince of Persia; and when I go out, behold, the prince of Greece will come. But I will tell you what is inscribed in the book of truth: there is none who contends by my side against these except Michael, your prince. Zec 1:12-13 Then the angel of the LORD said, ‘O LORD of hosts, how long will you have no mercy on Jerusalem and the cities of Judah, against which you have been angry these seventy years?’And the LORD answered gracious and comforting words to the angel who talked with me. Mat 18:10 See that you despise not one of these little ones: for I say to you, that their angels in heaven always see the face of my Father who is in heaven. Mat. 13:49-50 So it will be at the close of the age. The angels will come out and separate the evil from the righteous and throw them into the fiery furnace. In that place there will be weeping and gnashing of teeth. Luk 15:7 Just so, I tell you, there will be more joy in heaven over one sinner who repents than over ninety-nine righteous persons who need no repentance. Act 12:6-11 And when Herod would have brought him forth, the same night, Peter was sleeping between two soldiers, bound with two chains: and the keepers before the door kept the prison. And behold an angel of the Lord stood by him and a light shined in the room. And he, striking Peter on the side, raised him up, saying: Arise quickly. And the chains fell off from his hands. And the angel said to him: Gird thyself and put on thy sandals. And he did so. And he said to him: Cast thy garment about thee and follow me, and going out, he followed him. And he knew not that it was true which was done by the angel: but thought he saw a vision..And when Peter was come to himself, he said, Now I know of a truth, that the Lord hath sent forth his angel and delivered me out of the hand of Herod, and from all the expectation of the people of the Jews. Gal. 3:19 Why then the law? It was added because of transgressions, until the offspring should come to whom the promise had been made, and it was put in place through angels by an intermediary. 1 Tim. 5:21 In the presence of God and of Christ Jesus and of the elect angels I charge you to keep these rules without prejudging, doing nothing from partiality. Heb 1:13 And to which of the angels has he ever said, “Sit at my right hand until I make your enemies a footstool for your feet”? Are they not all ministering spirits sent out to serve for the sake of those who are to inherit salvation? Heb. 13:2 Do not neglect to show hospitality to strangers, for thereby some have entertained angels unawares. St. Gregory Thaumaturgus ca. 213-270 a.d.
2 Macc. 15:12-16 Now the vision was in this manner. Onias, who had been high priest, a good and virtuous man, modest in his looks, gentle in his manners, and graceful in speech, and who from a child was exercised in virtues holding up his hands, prayed for all the people of the Jews: After this there appeared also another man, admirable for age, and glory, and environed with great beauty and majesty: Then Onias answering, said: This is a lover of his brethren, and of the people of Israel: this is he that prayeth much for the people, and for all the holy city, Jeremias, the prophet of God. Whereupon Jeremias stretched forth his right hand, and gave to Judas a sword of gold, saying: Take this holy sword, a gift from God, wherewith thou shalt overthrow the adversaries of my people Israel. Sirach 46:16, 22-23 Samuel the prophet of the Lord, the beloved of the Lord his God, established a new government, and anointed princes over his people. And before the time of the end of his life in the world, he protested before the Lord, and his anointed: money, or any thing else, even to a shoe, he had not taken of any man, and no man did accuse him. And after this he slept, and he made known to the king, and shewed him the end of his life, and he lifted up his voice from the earth in prophecy to blot out the wickedness of the nation. Baruch 3:4 O Lord Almighty, thou God of Israel, hear now the prayers of the dead Israelites, and of their children, which have sinned before thee, and not hearkened unto the voice of thee their God: for the which cause these plagues cleave unto us. Mat. 27:47 And about the ninth hour Jesus cried with a loud voice, saying, Eli, Eli, lama sabachthani? that is to say, My God, my God, why hast thou forsaken me? Some of them that stood there, when they heard [that], said, This [man] calleth for Elias. Luk 9:28-32 Now about eight days after these sayings he took with him Peter and John and James and went up on the mountain to pray. And as he was praying, the appearance of his face was altered, and his clothing became dazzling white. And behold, two men were talking with him, Moses and Elijah, who appeared in glory and spoke of his departure, which he was about to accomplish at Jerusalem. Now Peter and those who were with him were heavy with sleep, but when they became fully awake they saw his glory and the two men who stood with him. Rev 5:8 And when he had taken the scroll, the four living creatures and the twenty-four elders fell down before the Lamb, each holding a harp, and golden bowls full of incense, which are the prayers of the saints. Rev. 6:9-11 When he opened the fifth seal, I saw under the altar the souls of those who had been slain for the word of God and for the witness they had borne. They cried out with a loud voice, “O Sovereign Lord, holy and true, how long before you will judge and avenge our blood on those who dwell on the earth?” Then they were each given a white robe and told to rest a little longer, until the number of their fellow servants and their brothers should be complete, who were to be killed as they themselves had been. 1 En. 39:4-5 (non-canonical) And there I saw another vision, the dwelling-places of the holy, And the resting-places of the righteous. Here mine eyes saw their dwellings with His righteous angels, And their resting-places with the holy. And they petitioned and interceded and prayed for the children of men, And righteousness flowed before them as water, And mercy like dew upon the earth: Thus it is amongst them for ever and ever. 1 En. 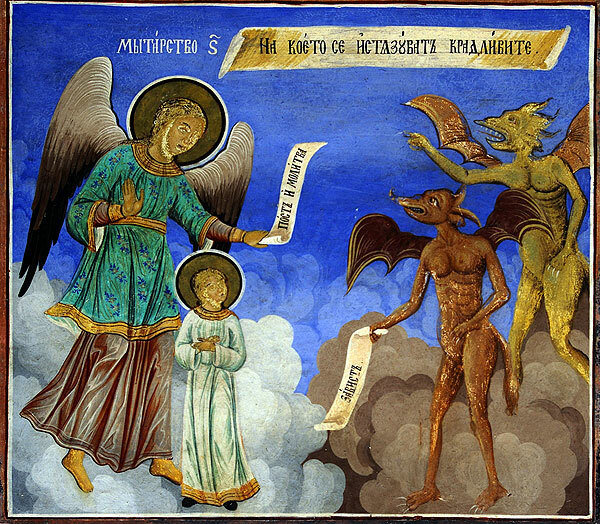 47:1-2 (non-canonical) And in those days shall have ascended the prayer of the righteous, and the blood of the righteous from the earth before the Lord of Spirits. In those days the holy ones who dwell above in the heavens shall unite with one voice and supplicate and pray [and praise, and give thanks and bless the name of the Lord of Spirits] on behalf of the blood of the righteous which has been shed, And that the prayer of the righteous may not be in vain before the Lord of Spirits. That judgement may be done unto them, and that they may not have to suffer for ever. A Christian people celebrates together in religious solemnity the memorials of the martyrs, both to encourage their being imitated and so that it can share in their merits and be aided by their prayers. (Against Faustus the Manichean). Thou gainest nothing, thou prevailest nothing, O savage cruelty. His mortal frame is released from thy devices, and, when Laurentius departs to heaven, thou art vanquished. The flame of Christ’s love could not be overcome by thy flames, and the fire which burnt outside was less keen than that which blazed within. 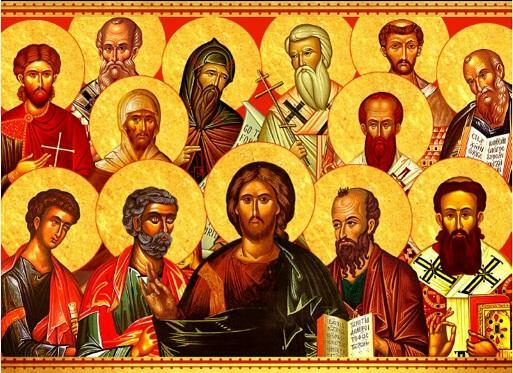 But what shall I say of the bodies of the blessed apostles, when it is well known that, at the time when they suffered, believers came from the East to recover their bodies as being those of their own countrymen? And, having been taken as far as the second milestone from the city, they were deposited in the place which is called Catacumbas. But, when the whole multitude came together and endeavoured to remove them thence, such violence of thunder and lightning terrified and dispersed them that they on no account presumed to attempt such a thing again. And then the Romans, who of the Lord’s loving-kindness were counted worthy to do this, went out and took up their bodies, and laid them in the places where they are now deposited. Who then, most serene lady, can there be so venturesome as, knowing these things, to presume, I do not say to touch their bodies, but even at all to look at them? Such orders therefore having been given me by you, which I could by no means have obeyed, it has not, so far as I find, been of your own motion; but certain men have wished to stir up your Piety against me, so as to withdraw from me (which God forbid) the favour of your good will, and have therefore sought out a point in which I might be found as if disobedient to you. 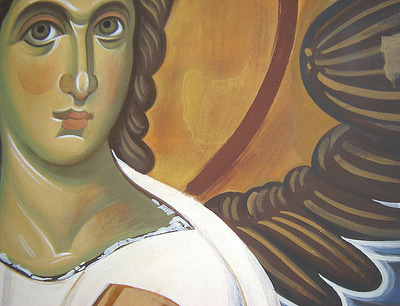 But I trust in Almighty God that your most kind good will is in no way being stolen away from me, and that you will always have with you the power of the holy apostles, whom with all your heart and mind you love, not from their bodily presence, but from their protection. Eph. 3:14-19 For this reason I kneel before the Father, from whom his whole family in heaven and on earth derives its name. I pray that out of his glorious riches he may strengthen you with power through his Spirit in your inner being, so that Christ may dwell in your hearts through faith. And I pray that you, being rooted and established in love, may have power, together with all the saints, to grasp how wide and long and high and deep is the love of Christ, and to know this love that surpasses knowledge–that you may be filled to the measure of all the fullness of God. Col 1:12 …giving thanks to the Father, who has qualified you to share in the inheritance of the saints in light. Heb. 12:18-24 You have not come to a mountain that can be touched and that is burning with fire, to darkness, gloom and storm, to a trumpet blast or to such a voice speaking words that those who heard it begged that no further word be spoken to them, because they could not bear what was commanded: If even an animal touches the mountain, it must be stoned. The sight was so terrifying that Moses said, ‘I am trembling with fear.’ But you have come to Mount Zion, to the heavenly Jerusalem, the city of the living God. You have come to thousands upon thousands of angels in joyful assembly, to the church of the firstborn, whose names are written in heaven. You have come to God, the judge of all men, to the spirits of righteous men made perfect, to Jesus the mediator of a new covenant, and to the sprinkled blood that speaks a better word than the blood of Abel. How Can They Hear Us? 2Ki 5:25-27 He went in and stood before his master, and Elisha said to him, “Where have you been, Gehazi?” And he said, “Your servant went nowhere.” But he said to him, “Did not my heart go when the man turned from his chariot to meet you? Was it a time to accept money and garments, olive orchards and vineyards, sheep and oxen, male servants and female servants? Therefore the leprosy of Naaman shall cling to you and to your descendants forever.” So he went out from his presence a leper, like snow. Eze 8:1-3 In the sixth year, in the sixth month, on the fifth day of the month, as I sat in my house, with the elders of Judah sitting before me, the hand of the Lord GOD fell upon me there. Then I looked, and behold, a form that had the appearance of a man. Below what appeared to be his waist was fire, and above his waist was something like the appearance of brightness, like gleaming metal. He put out the form of a hand and took me by a lock of my head, and the Spirit lifted me up between earth and heaven and brought me in visions of God to Jerusalem, to the entrance of the gateway of the inner court that faces north, where was the seat of the image of jealousy, which provokes to jealousy. 1 Cor. 4:9 For I think that God has exhibited us apostles as last of all, like men sentenced to death, because we have become a spectacle to the world, to angels, and to men. 1 Cor. 6:17 But he who is joined to the Lord becomes one spirit with him. The man of God, Bennet, being diligent in watching, rose early up before the time of matins (his monks being yet at rest) and came to the window of his chamber, where he offered up his prayers to almighty God. Standing there, all on a sudden in the dead of the night, as he looked forth, he saw a light, which banished away the darkness of the night, and glittered with such brightness, that the light which did shine in the midst of darkness was far more clear than the light of the day. Upon this sight a marvellous strange thing followed, for, as himself did afterward report, the whole world, gathered as it were together under one beam of the sun, was presented before his eyes, and whiles the venerable father stood attentively beholding the brightness of that glittering light, he saw the soul of Germanus, Bishop of Capua, in a fiery globe to be carried up by Angels into heaven. Then, desirous to have some witness of this so notable a miracle, he called with a very loud voice Servandus the Deacon twice or thrice by his name, who, troubled at such an unusual crying out of the man of God, went up in all haste, and looking forth saw not anything else, but a little remnant of the light, but wondering at so great a miracle, the man of God told him all in order what he had seen, and sending by and by to the town of Cassino, he commanded the religious man Theoprobus to dispatch one that night to the city of Capua, to learn what was become of Germanus their Bishop: which being done, the messenger found that reverent Prelate departed this life, and enquiring curiously the time, he understood that he died at that very instant, in which the man of God beheld him ascending up to heaven. PETER: A strange thing and very much to be admired. But whereas you say that the whole world, as it were under one sunbeam, was presented before his eyes, as I must needs confess that in myself I never had experience of any such thing, so neither can I conceive by what means the whole world can be seen of any one man. 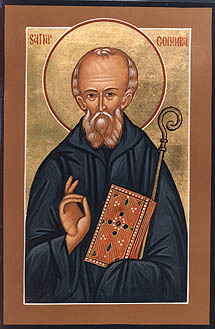 Hence this same man of the Lord, St. Columba, when a few of the brethren would sometimes inquire into the matter, did not deny but that by some divine intuition, and through a wonderful expansion of his inner soul, he beheld the whole universe drawn together and laid open to his sight, as in one ray of the sun.